Discover our exclusive breakfast room where you can enjoy a full buffet service with high-quality products. Canal+ and all sporting events on pay channels are completely free of charge for you to enjoy, in the bar as well as in your room. Vincci Mercat gives you personalised attention 24 hours per day. We are always at your disposal for anything you need. Right in the centre of Valencia, this lounge bar is the ideal space for you to disconnect, relax and have a drink. The hotel only has Canal+, Liga y Canal + Champions in the bar. 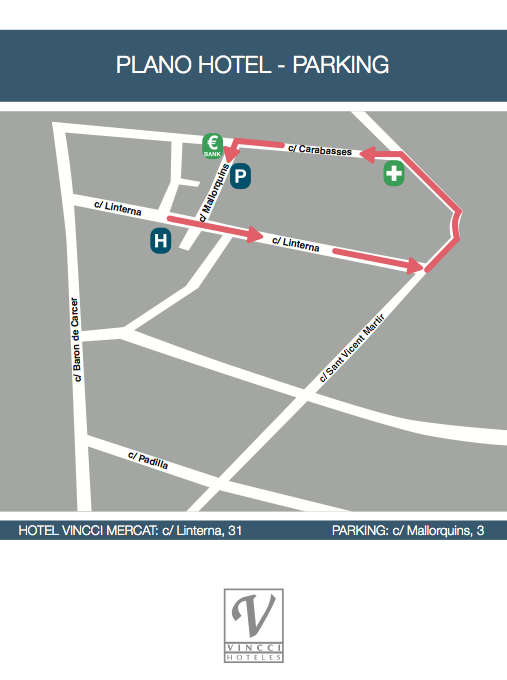 Enjoy the advantages of our parking right in the centre of Valencia, next to the Mercat Central. A privileged space where you can refresh yourself and enjoy the sun right in the heart of Valencia, featuring exclusive design and the best view of the city rooftops. Dimensions: 5.70m. x 3.70m. 1.10m depth.